SURABAYA, -- Total Unit KOPASKA (Kopaska) Navy will be increased from two to three units. These additions follow the development plan amount Fleet RI, from two to three fleets. Kopaska Unit submitted the plan to increase Satkopaska Koarmatim Colonel Commandant of the Sea (E) Yudhi Bramantyo after pinning Human brevet Frogs on the former education students brevet Kopaska, while closing brevet education Kopaska Force XXXVIII, in the Maluku Sea Field Command Naval Education Development (Kobangdikal), Bumimoro , Surabaya, yesterday. "Kopaska were originally two units, will be increased to three units, according existence of the fleet that will be developed into three," said Yudhi Bramantyo, yesterday. According to him, each fleet, both western, eastern, and central, will have each Satkopaska. Each fleet there is one unit. Kopaska required countries such as Indonesia is an archipelago. The addition of this Kopaska Unit continues to ripen as fleet development summarized in archipelago fleet. TNI Commander Rear Admiral Kobangdikal ingn Ary Atmaja said Kopaska is a special forces recruited and educated, specially trained. 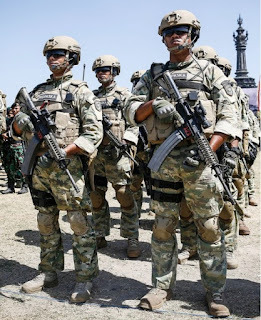 Where, Kopaska soldiers using special equipment to carry out tasks which can not be carried out regular forces, especially in carrying out the special sea battle, Naval Special Warfare. Kopaska education, said Ary, has goals and objectives, namely forming KOPASKA qualified soldiers who have the skills and ability to perform the tasks beraspek four media, the media land, air, sea and underwater. It is known, on the embedding license yesterday displayed a number of demonstrations, including the release of hostages from terrorist groups. With alertness and expertise, frog forces succeeded in crippling the terrorist group. The Indonesia's Naval Special Forces (KOPASKA) were photographed with AR-15/M4 type rifles and Surefire 100 round magazine.